New Melones Lake is currently holding 524,809 acre-feet of water. The lake level came up two feet this past week and should continue to rise with the recent and upcoming rainfall. It is currently at 863 ft. above sea level and 222 ft. from full. The water clarity is clear in most of the lake with a slight stain in some areas. The water temperature is cooling, with the average being 57-61 degrees. The concrete ramp is CLOSED and should re-open once the lake reaches 865 ft. There is also a courtesy dock on the dirt launch which will be in place until the concrete ramp is open again. The trout appear to be in transition from deep to shallow water. A population of fish will hold deep until the lake has completely turned over. However, some fish have moved to the surface and can be found feeding on small insects. On calm days, look for dimples on the surface to find feeding fish. Many fish will follow the shad to the backs of primary creek channels. Trolling anglers have been catching a few giant trout while trolling in deep water on the main lake. 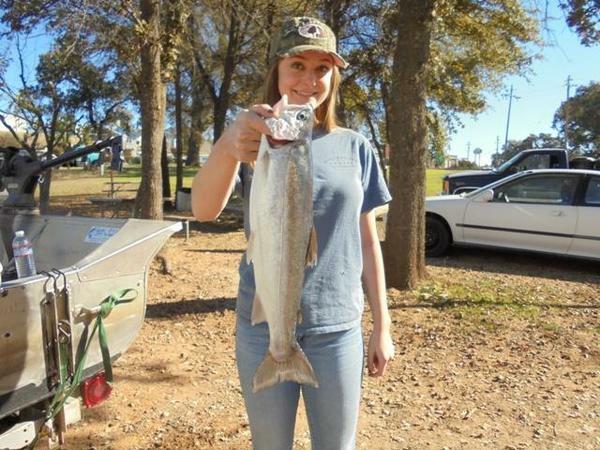 The bite has been fairly tough and most anglers are catching one or two big fish each outing. Try using Rapalas and large trolling spoons to trigger strikes from these 3 to 5-pound rainbows. Also, rolling shad is a good choice and will tempt some larger fish. Bank anglers should start to catch some fish from the shoreline. The surface temperature is dropping and the lake will soon turn over. The large trout will move shallow. Try soaking some garlic scented Power Bait with a chunk of crawler. Or, casting a spoon and with a moderate/fast retrieve to trigger strikes from fish that are cruising near the surface. Glory Hole Sports Big Fish of the Week goes to Mario Lopez of Riverbank. 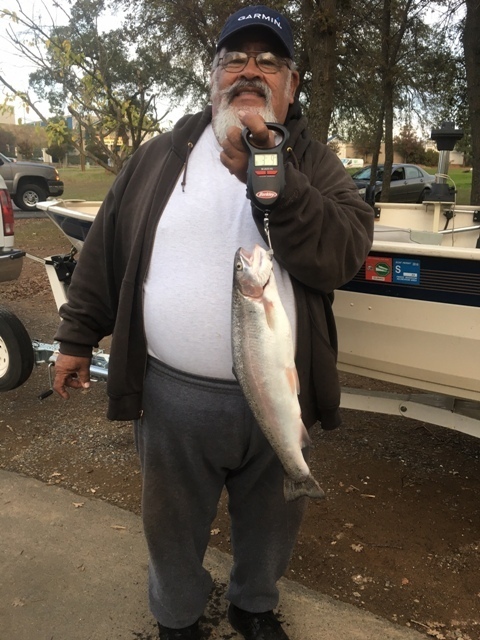 He caught a beautiful 3-pound, 9-ounce rainbow trout while trolling a homemade hoochie on the main lake. The bass are in a fall-like pattern and seem to be feeding heavily and bulking up for the winter months to come. Many fish will follow the shad into the backs of the major creek channels. Look for the bait and the bass will be nearby. The best way to find fish is to use a presentation that will productively cover water. Ripbaits, crankbaits and small swimbaits can be fished at various speeds and used to target different depths and locations. Once you find a productive area try slowing down and fishing a jigging spoon or a dropshot rig. Many bottom bouncing presentations will also work. A football head jig is a go-to lure selection during the colder months. Use variations of brown, green pumpkin and purple. A shakeyhead with a Roboworm worked great last week and put some quality fish in the boat. Shad patterns and natural colors seemed to really attract fish. Some anglers are tossing large swimbaits to catch some giant bass. It is a tough bite to chase and you may only get a bite or two all day. PLEASE PRACTICE CATCH AND RELEASE. Take photos and carefully release the fish back into to the lake to maintain a healthy fish population for generations to come. We are down to the last couple of days of our Glory Hole Sports Fall Catfish Contest. Unfortunately the fish did not cooperate with us and very few were brought to the scales to be weighed. This has left the door wide open for any angler in the contest to cash a pretty nice check. One or two fish could pay well. Generally this can be a great time of the year to target the large catfish. They will move shallow and feed heavily in preparation for the colder months to come. Try using frozen shad and other frozen fish to tempt nearby catfish. Many anglers do well on chicken livers and nightcrawlers. Catfish will feed primarily by scent. Try adding scent to your presentation. It is best to fish many different areas to locate the catfish. Try casting one line in shallow water and one line out deep. Look for areas that have had running water in the past few days. These areas will wash nutrients into the lake and attract crawdads and small fish. The bigger fish will come in to feed on these smaller creatures. Glory Hole Sports Big Fish of the Week goes to Ted Campbell. 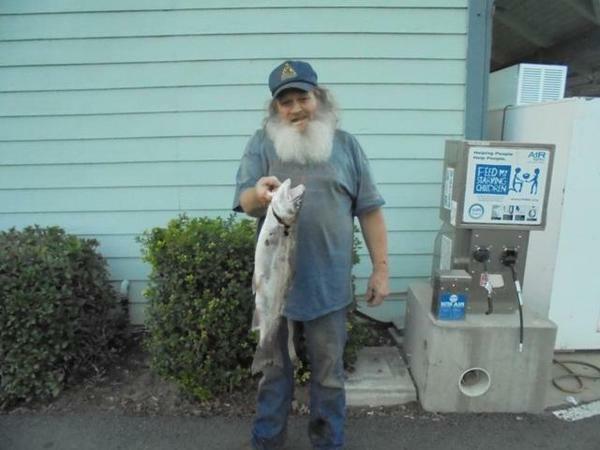 He caught a nice 11.46-pound catfish that will put him toward the top of the catfish contest. Very few anglers have been targeting the crappie. The winter months can be good and the crappie will move into creek arm and feed on shad. Use mini jigs and live minnows to catch crappie.